Do you know how much your child’s backpack weighs? According to the APTA if it’s more than 15 percent of his or her body weight, then it could hurt your child’s back. Millions of students in the United States carry backpacks to and from school, often overloaded with books, supplies and equipment. Weight of the backpack and improper use can result in injury to the skeletally immature child. During adolescence kids are going through growth spurts and so their bones and posture are vulnerable to injury. Injury can result when a child carrying a heavy backpack uses bad posture or shifts there weight abnormally to adapt a heavy load. These adaptations can cause pain from disk injury, improper spinal alignment and deformity. In addition, the muscles of neck, shoulder region and lower back can be strained leading to injury. In more advanced cases, a child may even experience nerve compression and damage. Some of the warning signs that a problem may be arising include back pain, fatigue, red marks on the shoulders, tingling or numbness in the arms and a shift or leaning in one direction. – Backpacks should be worn on both shoulders for equal weight distribution, and the height should fall two inches below the shoulder blades and sit at waist level. – It should have padded shoulder straps, which distribute the weight in the bag evenly over his/her shoulders. – Shoulder straps should fit comfortably on the shoulder and under the arms, so the arms can move freely. – The bottom of the pack should rest in the contour of the lower back. – Keep the load 10-15% or less of the child’s body-weight. TheraSport Physical Therapy can help you and your child choose a proper backpack that fits your child properly. Additionally, our physical therapists can help your child improve their posture, correct muscle imbalances and manage the pain from improper backpack use. TheraSport has two board-certified McKenzie credentialed practitioners to help with all spinal related problems. Shoulder pain is common with swimmers. When you swim, you use many muscle groups, some which are highly dependent on the shoulder for coordinated function. Numerous muscles are all working simultaneously to stabilize the shoulder. flexibility so you can swim conditioned without fatigue or injury. Do you feel that you can predict weather with your joint pain? Some people with arthritis feel that their joint pain is increased when it is about to rain or with a total change to weather pattern. The barometric pressure and temperature change (especially lowering) are key factors to why some people experience arthritic joint pain or in areas of injury. The possibility of this, is a change in the atmospheric pressure and precipitation which could increase swelling in the joint capsule for some people. So believe it or not, predicting the weather with joint pain has some validity. Contact TSPT today to find out how we can help develop a program to treat your condition and get you back batting in proper form! Ulnar Collateral Sprain: This injury involves spraining or tearing of the ligament that stabilizes the inside of the elbow joint. This injury often occurs due to poor mobility/strength in the shoulder or from “over throwing”. Therapy can help this condition unless there is complete tearing which requires “Tommy John” Surgery. Labral Injury: The Glenoid labrum is a cartilage washer in your shoulder that helps to increase the stability of the joint. Symptoms of labral injury include popping, feeling of instability in the shoulder, and “dead arm” after throwing. Rotator Cuff Strain: Overhead Athletes are at a higher risk for injury to their rotator cuffs. The rotator cuff is a group of four muscles that help with stability and movement of the shoulder. Overhead motion can pinch these muscles and over stress them causing injury. Lumbar/Abdominal Strain: Hitting and throwing involves a lot of trunk rotation, which can cause strain in the abdominal and lower back muscles. Therapy can help decrease the pain and increase the strength in this muscle with sport specific exercises. There are all kinds of events that have the potential for disrupting our lives. A near fatal car accident certainly fits that description. A resulting concussion interrupts life for both the sufferer and for those who love them. That is exactly what Deana Leonard faced on a December afternoon in 2014. As she and her mother were on their way Christmas shopping, a man “late to work” blew through a red light and hit their car on the driver’s side, demolishing the front end. Deana’s mom was injured by the seat belt and fortunately healed without issue. Deana, however, was not so lucky. After the collision, Deana jumped out of the car and instantly felt nauseous. Her head was hurting. Her focus was on her mom. And she was scared! The police wanted her to go to the hospital. She said “no.” She was terrified, she thought, but not hurt. She just wanted to go home and go to bed. When Deana came to see me, she felt like her head was in constant motion. Clinically she presented with motion sensitivity, dizziness, imbalance, light sensitivity, head pressure and cervical stiffness. Her injuries were the result of the air bag deployment. During the balance exam her BESS (Balance Error Scoring System) score was a 22 (normal is 10 or less); her timed heel/toe walk (10 feet with turn) was 21 seconds (normal is less than 14 seconds without losing balance). Her MSQ (motion sensitivity quotient) showed a severe handicap at 52 percent. All other tests supported the finding of concussion. Her first appointment with me was December 31, 2014, seventeen days after her accident. 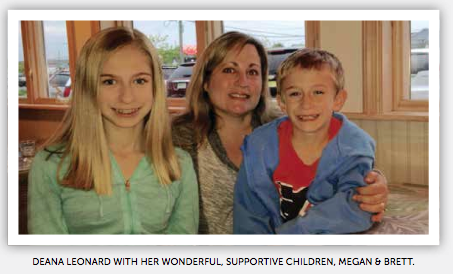 she went for her check-in with the concussion specialist at CHOP in early February she was able to report that she felt much better – fewer headaches, more balanced. As a middle school guidance counselor, Deana tried not to miss too much work. In total she missed only six days. Her principal was very supportive of her situation. Her students were terrific! In her role, she had always handled accommodations of concussion cases for students but now she has a deeper appreciation of how to coach teachers who “resist” the reality that a concussion is serious business. Her advice to others? If you are in a car accident, GO TO THE HOSPITAL! Don’t wait. Concussions are no joke! Deana graduated from VRT on April 30. She is doing well and is grateful that her fear that she would never be normal again has been replaced with regained balance and no car sickness! Jennifer Liss is “Susan Herdman certified” in Vestibular Rehabilitation. She is an Adjunct Professor of Kinesiology at Rowan University in Glassboro, NJ. TheraSport Physical Therapy offices are located in New Jersey, where she has practiced for 16 years. She can be reached at JenLiss@Therasport.org. Sherron Laurrell is a vestibular patient who has been treated by Dr.Liss. They now collaborate on case studies to educate and help others. March Madness at TheraSport Physical Therapy! March Madness is in full effect at TheraSport Physical Therapy! March Madness 2015 is NCAA basketball’s prestigious championship tournament, and now it is in full swing! Basketball players are susceptible to Achilles injuries. The Achilles is the strongest and longest tendon in the body. It attaches to the heel bone, and causes the foot to push off the ground when the calf muscles tighten. When overused, your Achilles can become inflamed and cause tendinitis. Make an appointment at TheraSport today to find out what preventative measures you can take to avoid tendinitis and other injuries! 2014 Back-To-School Tips from TheraSport Physical Therapy!